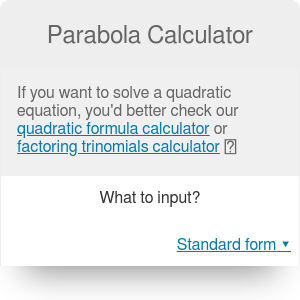 Any time you come across a quadratic formula you want to analyze, this parabola calculator will be perfect for you. Not only will it provide you with the parabola equation in the standard form and in the vertex form, but also calculate the parabola vertex, focus and directrix. Parabola is a U-shaped symmetrical curve. Its main property is that every point lying on the parabola is in an equal distance to a certain point, called the focus of a parabola, and a line, called its directrix. It is also the curve that corresponds to quadratic equations. The axis of symmetry of a parabola is always perpendicular to the directrix and goes through the focus point. The vertex of a parabola is the point at which the parabola makes the hardest turn; it lies halfway between the focus and the directrix. A real-life example of a parabola is the path traced by an object in projectile motion. The standard form of the quadratic equation is y = ax² + bx + c. You can use this vertex calculator to transform it to the vertex form that allows you to find the important points of the parabola - vertex and focus. k is the y-coordinate of the parabola vertex. Enter the coefficients a, b and c of the standard form of your quadratic equation. Let's assume that the equation was y = 2x² + 3x - 4, what makes a = 2, b = 3 and c = -4. Parabola Calculator can be embedded on your website to enrich the content you wrote and make it easier for your visitors to understand your message.